Worldwide, the prevalence of obesity is increasing dramatically, and recent estimates show that nearly two thirds of the U.S. adult population is now either overweight or obese (1). Meanwhile, pediatric obesity is increasing at an even more alarming rate, suggesting that this epidemic is unlikely to abate soon (2). Although increasing body weight, as defined by body mass index (BMI), is a powerful predictor of metabolic disease risk, (3) genetic and environmental factors cause considerable variability in the manifestation of type 2 diabetes and atherosclerosis for any given degree of obesity (4). One potential explanation for these differences is that individuals with the same BMI may have vastly different amounts of visceral (also referred to as “central” or “abdominal”) fat, the adipose tissue depot known to be associated with the greatest metabolic risk (5,6⇓). When visceral obesity is accompanied by a constellation of metabolic derangements, including insulin resistance, low HDL, elevated triglycerides, and raised BP (7), the predicted cardiovascular disease risk is increased significantly (8). This adverse metabolic profile is now referred to as the metabolic syndrome and is a highly prevalent condition in the United States, affecting nearly 25% of all adults (9). Clinically, the identification of these high-risk, obese patients has benefited from the recent publication of definitions by the National Cholesterol Education Program expert panel and the World Health Organization (10,11⇓). Although the criteria differ slightly (Table 1), the respective definitions both serve the clinical function of identifying obese patients who are at greater risk of developing comorbid metabolic conditions, including type 2 diabetes, hypertension, hyperlipidemia, and cardiovascular disease (12), allowing for earlier and more directed interventions. Although current theories focus on insulin resistance as the prime factor linking visceral obesity with adverse metabolic changes (7), studies suggest that the pathophysiology of the metabolic syndrome cannot be explained by insulin resistance alone (13). Beyond glucose homeostasis, dyslipidemia, and BP, many other pathophysiologic features have been characterized in individuals with the metabolic syndrome. Among these, evidence of chronic systemic inflammation is one of the most consistent (14), and numerous inflammatory markers are highly correlated with the degree of obesity and insulin resistance (15); many of these inflammatory markers are, in turn, highly predictive of vascular disease risk (16). This review discusses the potential role of inflammation within fat in generating the metabolic syndrome, focusing on cytokines secreted by adipose tissue that modulate the immune system in favor of chronic systemic inflammation. The inflammatory roles of leptin, a fat-specific cytokine crucial to the control of energy balance, as well as the classical proinflammatory cytokines IL-6 and TNF-α, are highlighted specifically. The conceptual transformation of adipose tissue from a passive organ of energy storage to an active participant in hormonal regulation of homeostatic systems occurred relatively recently. In 1994, adipose tissue was identified as the source of the hormone leptin, opening the door for a new era of research focused on adipocyte endocrinology (17). In the past decade, the endocrine role of leptin has expanded to include regulation of reproduction (18) and immune function (19), and numerous other adipose tissue-derived molecules that have an impact on glucose homeostasis, vascular biology, tumor development, lipoprotein metabolism, and inflammation (20) have been identified, and these inflammatory factors are listed in Table 2. However, adipose tissue is an inhomogeneous organ that consists of a variety of cell types, a fact that has prompted significant debate as to the true role of the adipocyte versus stromal/vascular and immune cells in secreting some of these endocrine and paracrine regulators. In fact, mature adipocytes seem to lack the storage vesicles and other structural cellular components usually associated with regulated release of secreted proteins by endocrine cells. In addition, the frequent use of pre-adipocyte cell lines to study adipocyte biology in vitro has added to this controversy because the functional characteristics (21) and transcriptional patterns of these multipotent cells are similar to immune cells. In fact, immature fat cells can transdifferentiate into macrophages both in vitro and in vivo. (22). Recent studies using large-scale genetic analyses to characterize gene expression patterns in adipose tissue from a variety of obese and lean mice have begun to clarify the role of the adipocyte as a hormone and cytokine secreting cell (23,24⇓). Surprising, in these studies, increasing adiposity in mice correlates very highly with the adipose tissue expression of a large cluster of genes characteristically expressed by macrophages, and both adipocyte size and total body weight are strong predictors of the number of mature macrophages found within adipose tissue, the correlation being even stronger for visceral than for subcutaneous fat. These bone marrow-derived macrophages seem to invade fat in response to as-yet-unknown signals and in obese animals tend to aggregate and form giant cells characteristic of chronic inflammatory disorders, suggesting that adipose tissue is a site of active inflammation. Gene expression studies on sorted cells from adipose tissue revealed that macrophages produce almost all TNF-α, whereas mature adipocytes secrete the majority of leptin and roughly equal IL-6 gene expression was found within macrophages, adipocytes, and nonmacrophage stromal-vascular cells. Importantly, these studies suggest that macrophage invasion of fat and inflammation-related gene expression in adipose tissue may be a sentinel event, preceding the development of insulin resistance in these animals. Therefore, weight gain in mice is associated with infiltration of fat by macrophages and elaboration of proinflammatory signals from adipose tissue. Notably, these inflammatory changes are most marked within visceral fat, the fat depot associated with greatest metabolic risk, and seem to precede other features of the metabolic syndrome, including impaired glucose homeostasis. The existing paradigm of adipose tissue endocrinology has been changed significantly by introducing immune cells as a source of inflammatory mediators released from adipose tissue, as well as a paracrine regulator of adipocyte function and hormone secretion, thereby potentially controlling the metabolic changes that result from excess adiposity. Research designed to elucidate the signals that attract macrophages to fat and dissect the paracrine mechanisms whereby adipose tissue macrophages and adipocytes communicate is likely to identify therapeutic targets that may decrease fat-induced inflammation and perhaps diminish the metabolic risk associated with obesity. Although that macrophages infiltrate fat as a result of obesity is surprising, interactions between adipose tissue and the immune system are well described, and various theories have been put forth to try to address the question of why such a link should exist (19). White adipose tissue and bone marrow share an embryologic origin, the mesoderm, and pre-adipocytes are potent phagocytes that resemble macrophages in both morphology and patterns of gene expression (21). In addition, mature adipocytes share the ability to secrete cytokines and activate the complement cascade much like mononuclear immune cells. One line of reasoning connecting fat and the immune system is based on the role of the adipocyte hormone leptin in the control of energy homeostasis and immunity. During fasting/starvation, when plasma leptin levels decline, neural pathways in the hypothalamus cause appetite to increase and energy expenditure to decrease, an attempt to restore body fat stores (25). In addition, the fall in plasma leptin diminishes thyroid hormone production (26) and inhibits the reproductive axis, both effects that save energy during nutritionally lean times (27). However, starvation also inhibits the immune system, resulting in increased apoptosis in the thymus and decreased mononuclear cell proliferation, effects that can be entirely reversed by administering leptin alone in the absence of refeeding (28). Because maintaining immune function has been estimated to account for as much as 15% of daily energy expenditure (29), here, too, leptin’s role may be taken as contributing to reducing overall energy expenditure; thus, the regulation of immunity by adipose tissue can be seen as an extension of the endocrine role of fat in energy homeostasis. The second argument for fat/immune system coordination is rooted in teleology. In Drosophila, the fat body is the organ that governs the innate immune system, secreting into the lymphatic system molecules that target ingested pathogens (30). Similarly, in vertebrates, fat may be one of the crucial alarm systems that rouses the innate immune system and triggers the acute-phase response, the first line of defense against bacterial infection. Certainly the adipose tissue production of leptin increases dramatically during acute infection (31), and fat may contribute to elevated circulating IL-6, TNF-α, and IL-1β, as well as numerous other factors that prime the immune system or participate directly in the defense against pathogenic organisms. The question of whether adipose tissue plays a significant role in controlling immune function in humans has yet to be answered conclusively; however, that adipose tissue can elaborate acute inflammatory signals suggests that dysregulation of the inflammatory capability of fat could play a role in triggering or perpetuating the chronic inflammation characteristic of the metabolic syndrome. Although acute and chronic inflammation are dissimilar in many ways, the metabolic perturbations seen during acute infection share many common features with the known characteristics of the metabolic syndrome. Most important, insulin resistance and hyperglycemia are common to both conditions, as are hypertriglyceridemia, impaired lipolysis, and increases in nonesterified fatty acids. Leptin, IL-6, TNF-α, the acute-phase reactant C-reactive protein (CRP) as well as other circulating inflammatory markers are elevated in both conditions. In addition, in rodents, more clearly than in humans, both obesity and acute infections are associated with an activation of the hypothalamic-pituitary-adrenal axis and increased circulating glucocorticoid levels. During acute infections, these metabolic changes are thought to be adaptive, sparing fuel for the brain, activating the complement cascade on bacterial cell surfaces, depriving bacteria of iron and other vital micronutrients, etc., but as with other adaptive physiologic processes, pathologic consequences may result when these acute changes become chronic. Equating metabolic syndrome-associated chronic inflammation with acute inflammatory responses to infection is clearly too facile, yet it highlights the intriguing possibility that immune/inflammatory factors may be at the root of the metabolic perturbations associated with both obesity and acute illness. The biologic response to a given cytokine may differ between acute and chronic inflammatory states, and the mechanism governing such differential responses often remains obscure. Clearly, although similar cytokine mediators seem to be involved, the nonmetabolic features of obesity and acute inflammatory syndromes are vastly different and multiple mechanisms may account for this variability, including differences in plasma cytokine concentration, presence of soluble cytokine receptors and receptor antagonists, balance of pro- versus anti-inflammatory cytokine networks at the tissue level, and presence of bacterial cell wall products, to name only a few of the many potential variables. One intriguing metabolic dissimilarity between these two conditions is worthy of mention, namely the control of appetite. Both chronic inflammatory conditions and acute infections are usually associated with anorexia and cachexia, which are believed to be cytokine mediated (32), whereas appetite in individuals with obesity/metabolic syndrome is not obviously diminished, despite elevations in the circulating concentrations of cytokines associated with anorexia. Therefore, although the possibility exists that the metabolic syndrome is caused by an inflammatory response gone awry and, perhaps more specific, an inflammatory response within adipose tissue that becomes maladaptive when chronically stimulated, the details of specific cytokine-mediated effects and the mechanistic role of various inflammatory mediators remains to be defined clearly. The following sections summarize the potential roles of three key adipose tissue-derived cytokines—leptin, IL-6, and TNF-α—in contributing to the manifestations of the metabolic syndrome. The adipocyte-derived hormone leptin is a critical mediator of energy balance that relays information regarding the depletion or accumulation of fat stores to the brain (25,33⇓). Although identified as a classic peptide hormone, the four α helix domains in the folded structure make leptin most similar to cytokines such as IL-2. Moreover, the leptin receptor (lepr) bears significant homology to type 1 cytokine receptors; therefore, the hormone leptin is in many ways more appropriately identified as a cytokine. Although the role of leptin in controlling energy homeostasis is increasingly well defined (25,33⇓), it remains unclear whether leptin plays a role in the inflammatory syndrome caused by abdominal obesity. Clearly, serum leptin concentrations rise in proportion to body adiposity (34); therefore, obese individuals with the metabolic syndrome generally have higher circulating leptin concentrations. However, obese individuals seem to be resistant to the hypothalamic effects of leptin (33); therefore, the catabolic pathways designed to reduce appetite and increase energy expenditure are not activated and excess body weight is maintained. Although many of leptin’s effects result from a direct action of leptin on hypothalamic neurons, the functional leptin receptor (long-form or leprb) is also found on many tissues outside the central nervous system (CNS), including immune cells (35,36⇓). Importantly, the mechanisms that are thought to contribute to hypothalamic leptin resistance (33), e.g., defective blood-brain barrier transport, are either moot or unproved in peripheral tissues, and no studies have documented peripheral leptin resistance in obese individuals. Therefore, immune cells may well be subject to increased leptin effects in obese individuals, a signal that, on the basis of animal studies, may serve to activate the innate immune system and shift the cognate immune system toward a predominance of a proinflammatory Th1 T cell population while reducing the regulatory Th2 phenotype (19). Although the immunomodulatory properties of increased leptin signaling are thought to be beneficial during acute infections in both rodents (37) and humans (38), chronically, this proinflammatory shift may be deleterious. In fact, very obese, leptin-deficient mice are protected from atherosclerosis despite all of the metabolic risk factors, suggesting that this hormone may contribute directly to the risk of vascular disease (39). Moreover, in a prospective study in humans, circulating leptin concentration was shown to be an independent risk factor in predicting cardiovascular events after anthropometric and metabolic risk factors had been controlled for (40). Therefore, chronically elevated concentrations of leptin, as seen in obese individuals, may potentially predispose to progression of atherosclerosis. These data, however, are somewhat incongruent with the fact that women generally have higher leptin levels than men (34) while having lower cardiovascular disease risk. Therefore, although increased serum leptin concentrations, through direct effects on the immune system, clearly may trigger a proinflammatory state, as yet only circumstantial data from rodent studies suggest that this cytokine contributes to the chronic low-grade inflammation associated with the metabolic syndrome. Most cytokines function predominantly as paracrine or autocrine factors. However, IL-6 is unusual in that it is a true endocrine cytokine, meaning that most cellular targets of this cytokine are distant from the site of release and the effects of IL-6 are correlated with the serum concentration (41). Within adipose tissue, both adipocytes and macrophages secrete IL-6 (23), and studies measuring arteriovenous increases of serum IL-6 concentration have clearly shown net secretion of IL-6 from adipose tissue depots, suggesting that fat accounts for roughly 30% of circulating IL-6 concentrations in humans (42). Like leptin, production of IL-6 by adipose tissue increases with increasing adiposity, and circulating IL-6 concentrations are highly correlated with percentage of body fat (43) and with insulin resistance (44). However, like leptin, in vitro studies have shown that for a given weight of adipose tissue, subcutaneous fat produces more IL-6 than visceral fat, thereby weakening the link between this cytokine and the visceral fat-dependent metabolic syndrome. Although the differential regulation of IL-6 secretion from different fat depots and from distinct adipose tissue cell types remains to be determined, humoral (insulin, glucocorticoids), neural (sympathetic nervous system activity), and paracrine (IL-1β, TNF-α) signals all have been shown to regulate IL-6 production from fat, and determining the factors that increase IL-6 production from visceral fat remains an important research goal. Although IL-6 is a highly pleiotropic cytokine, with hormonal effects on many tissues, the effects on the liver, bone marrow, and endothelium are thought to be most significant in contributing to the metabolic effects of obesity. Circulating IL-6 is the single most important factor controlling the hepatic acute-phase response, the rapid, coordinated physiologic reaction to tissue damage or infection designed to recruit host defense mechanisms, eliminate damaged cells, contain pathogens, and begin tissue repair (45). Of the many positive and negative acute-phase reactants, perhaps the most recognized is CRP, a member of the pentraxin family that attaches to the plasma membrane of damaged cells causing cell death through activation of the complement cascade (46). A large volume of epidemiologic data connect CRP to coronary events, atherosclerotic disease, and progression to type 2 diabetes (47,48⇓). Clearly, CRP is one of the strongest markers of metabolic risk and, in addition, may participate directly in the arterial cell wall mechanisms leading to atherosclerotic lesions and cardiac events (49). Because CRP production by the liver is governed by circulating IL-6 and because, in industrialized countries, the single most important determinant of serum IL-6 concentration is whole-body adiposity, it is likely, therefore, that this adipose tissue cytokine contributes significantly to the chronic systemic inflammatory disorder associated with the metabolic syndrome. Although increased CRP is the most recognized marker of IL-6 action, numerous other IL-6-dependent factors may contribute to cardiovascular risk. Increases of fibrinogen, another acute-phase reactant, are mediated by IL-6, as are increases in both platelet number and platelet activity, all of which would contribute to the risk of clot formation (50). Moreover, endothelial cells and vascular smooth muscle cells are targets of IL-6 action, resulting in increased expression of adhesion molecules and activation of local renin-angiotensin pathways, both modifications that favor vascular wall inflammation and damage (51). In the CNS, IL-6 is a powerful catabolic agent that leads to decreased food intake and increased energy expenditure, based on numerous studies involving the administration of IL-6 into the cerebral ventricles (52). The expression and release of IL-6 by neurons and glial cells seems to be essential for the effects of this cytokine on energy balance, but it remains unclear to what extent central IL-6 production is controlled by circulating IL-6 in the serum, although transport mechanisms seem to exist to deliver IL-6 across the blood-brain barrier (52). Importantly, mice with a genetic deletion of IL-6 develop adult-onset obesity, suggesting that this cytokine is involved in the chronic physiologic regulation of energy balance and that decreased IL-6 signaling is associated with weight gain (53). Therefore, if IL-6 secretion by adipose tissue contributes to energy homeostasis through an endocrine action on the CNS, then one could invoke a state of obesity-induced IL-6 resistance, much as described for the effects of obesity on leptin and insulin signaling. This supposition also suggests the possibility that increased adipose-tissue IL-6 secretion associated with obesity may be a regulatory mechanism attempting to correct excess body weight and achieve negative energy balance, as hypothesized for obesity-related increases in leptin. The systemic inflammation resulting from IL-6 effects on liver and endothelium therefore could be an unintended consequence of appropriately elevated IL-6 levels in the face of obesity and central IL-6 resistance. The endocrine cytokine IL-6, therefore, is a likely mediator of proinflammatory signaling from adipose tissue; however, strategies designed to block IL-6 action remain to be evaluated as treatments of the metabolic syndrome. Importantly, limiting IL-6 effects on liver and endothelium may well impair the normal host response to acute infection, whereas preventing IL-6 secretion from adipose tissue could potentially worsen obesity if peripheral IL-6 secretion provides negative feedback to hypothalamic areas that govern energy balance. The role of TNF-α in the systemic inflammatory response triggered by obesity has been studied extensively (54). Within adipose tissue, macrophages account for nearly all TNF-α production (23), and both TNF-α mRNA content and TNF-α production increase in adipose tissue of obese individuals (55). Circulating TNF-α concentration, in turn, also rises with increasing obesity and correlates with insulin resistance (56). However, a study measuring arteriovenous differences showed no net secretion of TNF-α from subcutaneous adipose tissue depots (42), and although in vitro studies have shown that visceral adipose tissue produces more TNF-α than subcutaneous fat (57), net secretion of TNF-α from visceral fat into the circulation has not yet been documented. Therefore, it remains unclear whether TNF-α secretion from adipose tissue directly accounts for the elevated serum TNF-α concentration seen in obesity. In vivo studies have complicated the interpretation of the role of circulating TNF-α, as two rodent studies using chimeric TNF-α receptor (58) or overexpression of a soluble TNF-α receptor fragment (59) both resulted in significant improvement of insulin resistance in obese rats, whereas other studies using anti-TNF-α antibodies had no effect on insulin action in obese rats (60) or in obese individuals with type 2 diabetes (61). Nonetheless, TNF-α clearly may have an important role as a paracrine factor in the inflammatory response triggered by obesity independent of circulating concentration of the cytokine. Within adipose tissue, TNF-α causes adipocyte insulin resistance through serine phosphorylation (inactivation) of both the insulin receptor (IR) and insulin receptor substrate 1 (IRS-1), both of which result in diminished activation of phosphoinositol-3-kinase, the essential second messenger signal that governs most of insulin’s metabolic effects (Figure 1) (62). 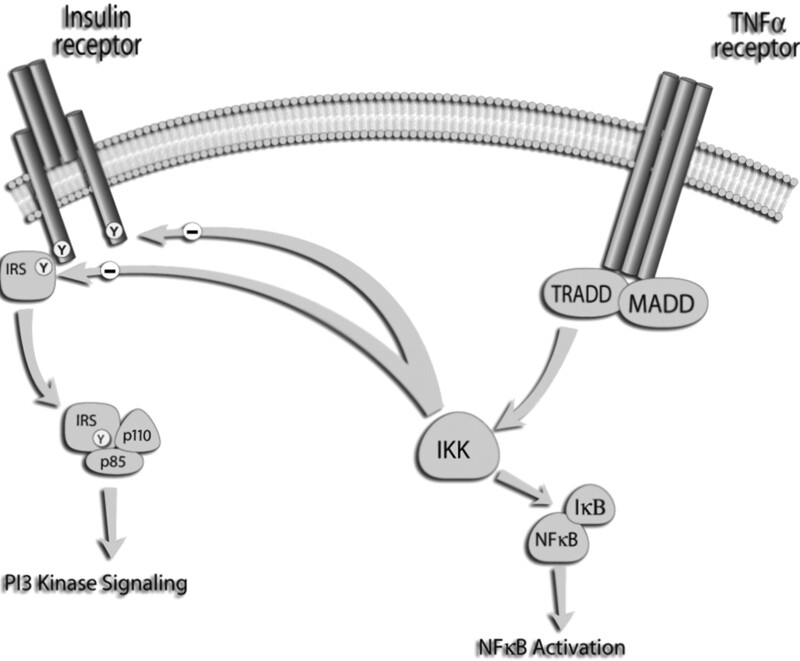 The intracellular pathways activated by the TNF-α receptor that interact with insulin signaling remain to be established but are thought to involve NF-κB and/or JNK signaling (63,64⇓). Impairment of activation of IR and IRS-1 has also been shown to occur in skeletal muscle (65), where it is proposed that TNF-α derived from macrophages within the fat depots that lie between myocytes may result in muscle insulin resistance via a paracrine mechanism (23). Surprising, this mechanism of insulin resistance does not occur in hepatocytes, even though the liver would presumably be the prime target for TNF-α released by visceral fat (66). Nonetheless, one in vivo study in rodents did show an improvement in hepatic insulin sensitivity when TNF-α was neutralized, suggesting that this cytokine may also have an impact on critical insulin-dependent pathways in the liver (59). Figure 1. Schematic overview of the potential interaction between the second messenger pathways activated by insulin and by TNF-α signaling. A second mechanism whereby TNF-α may contribute to insulin resistance is through elevations in circulating FFA levels caused by the induction of lipolysis and stimulation of hepatic lipogenesis (67). However, most of the effects of TNF-α on lipid metabolism have been studied under conditions of acute inflammation or with relatively high-dose intravenous TNF-α administration (68), casting doubt on the relevance of this mechanism to the pathophysiology of the metabolic syndrome given the more modest elevations in TNF-α seen in obesity. More recently, a third potential mechanism whereby TNF-α influences insulin resistance has been identified. Adiponectin secretion by adipocytes is potently reduced by TNF-α signaling (69), and this hormone seems to be a crucial mediator of insulin sensitivity, potentially explaining how paracrine effects of TNF-α within fat could cause systemic insulin resistance. However, predictions regarding the significance of TNF-α in the metabolic syndrome have been tempered significantly by the fact that mice with genetic deletions of either TNF-α or the TNF-α receptors demonstrate only modest protection from weight gain, hyperglycemia, and insulin resistance when obese (70,71⇓). Therefore, although TNF-α is a macrophage-derived inflammatory factor that contributes to insulin resistance in adipose tissue and muscle via paracrine and potentially endocrine mechanisms, other inflammatory molecules may be able to compensate for the absence of TNF-α signaling; thus, the viability of antagonists of TNF-α signaling in the treatment of the metabolic syndrome remains unclear. Although inflammation can clearly impair IR and IRS signaling, until recently, the intracellular mechanism whereby cytokines such as TNF-α prevent activation of these molecules has remained unknown. Experiments using in vitro models of insulin resistance have demonstrated that serine/threonine kinases can phosphorylate both IR and IRS molecules such that activation by tyrosine phosphorylation is prevented (72). Although cytokines are known to activate a number of intracellular serine/threonine kinases, considerable attention has now focused on the inhibitor κB kinase (IKK) complex as a mediator of insulin resistance (Figure 1). This enzyme complex is best known for a vital role in triggering the NF-κB pathway, a crucial second messenger system for inflammatory cytokine signaling (73). When activated, IL-1β and TNF-α receptors recruit kinases that activate the IKK complex. IKK2, the key catalytic subunit of the IKK complex, phosphorylates inhibitor κB, causing this cytoplasmic chaperone molecule to be degraded and allows the transcription factor NF-κB to translocate into the nucleus and activate inflammatory target genes (74). In vitro studies have shown that the activity of the IKK complex can be inhibited by high-dose salicylate administration (75). Moreover, high-dose aspirin was already described as a treatment of diabetes in the late 1800s (76) and dramatically decreases hyperglycemia and glycosuria in patients with diabetes (77). The astute juxtaposition of these two pieces of information led to a number of recent studies demonstrating conclusively a role for the NF-κB pathway in causing insulin resistance. High-dose aspirin administration, unlike other nonsteroidal anti-inflammatory compounds, reversed insulin resistance and normalized the activation of the insulin receptor and downstream insulin signaling molecules in obese rodents in vivo and in TNF-α-treated adipocytes in vitro (78). That mutant mice lacking one copy of the IKK2 gene (Ikk2+/−) had improved insulin sensitivity on both low-fat and high-fat diets and that this heterozygous mutation bred into leptin-deficient ob/ob mice was able to reduce hyperglycemia and improve glucose tolerance in these obese animals established that the IKK complex is a critical serine/threonine kinase that, when activated, results in insulin resistance by diminishing insulin-stimulated IR and IRS-1 activation. However, the strength of this conclusion was questioned recently by a genetic mouse model specifically lacking IKK2 activity only in muscle that did not develop insulin resistance even on a high-fat diet (79). Therefore, the IKK complex may be one of multiple cytokine-activated serine/threonine kinases that can cause insulin resistance, and recent evidence points to JNK as another TNF-α-activated kinase that may be involved in diminishing normal IR and IRS-1 function (63,80⇓). As multiple proinflammatory cytokines may have similar effects on insulin signaling, the shared, cytokine-induced second messenger pathways may be excellent therapeutic targets for the treatment of metabolic syndrome and type 2 diabetes. However, the individual role of these cytokine-induced pathways in skeletal muscle, adipose tissue, liver, and the CNS remains to be determined, and the issue of redundancy within signaling pathways will need to be overcome. Moreover, the potential immunosuppressive effects of compounds that globally dampen inflammatory signaling must remain a significant concern in the effort to design drugs to block the deleterious effects of chronic inflammation in obesity. Numerous other inflammatory mediators are produced and potentially secreted into the circulation by adipose tissue (Table 2). Among these, adiponectin (81), resistin (20), acylation-stimulating protein (82), and components of the renin-angiotensin system (83) may be the most important in contributing to chronic inflammation, insulin resistance, and cardiovascular disease risk. Chronic inflammation is a common feature of the metabolic syndrome, and inflammatory signals may originate within visceral adipose tissue as this fat depot expands in response to chronic positive energy balance. Both adipocytes and macrophages within fat secrete numerous hormones and cytokines that may contribute to the characteristic pathophysiologic changes seen in the metabolic syndrome, and local inflammation within adipose tissue may be the sentinel event that causes systemic insulin resistance and systemic inflammation, two of the cardinal features of the metabolic syndrome. The inciting event that causes adipose tissue to become inflamed as it expands remains unknown but will likely have a significant genetic component potentially accounting for some of the variance in metabolic risk between equivalently obese individuals. The contribution of individual cytokines in causing the pathophysiologic features of the metabolic syndrome remains controversial; however; that the metabolic alterations triggered by acute inflammation mimic the metabolic syndrome in many ways suggests that circulating cytokines, whether they are derived from adipose tissue or peripheral blood immune cells, may have similar metabolic effects on muscle, liver, and endothelium while potentially having differential effects on immune function. In addition, adipose tissue-derived cytokines, such as IL-6 and leptin, may also participate directly in endothelial cell activation and inflammation in the vascular bed, both changes that could contribute to the progression of atherosclerosis. Recognition of the interaction between adipocytes and macrophages within fat exposes a new paradigm whereby adipocyte-derived factors modulate local immune responses and macrophage-derived cytokines alter adipocyte differentiation and metabolic responses. As future studies continue to provide new information regarding links between inflammation and metabolism, the potential to identify new therapeutic options for the treatment of the metabolic syndrome remains high, encouraging the global effort to reduce the morbidity associated with this highly prevalent disease.